The comparison between a wood-burning fireplace and pellet fireplace coincides with the combination tradition vs convenience. There are those who would not be able to give up the sight of logs burning in the firebox and those who realise they wouldn’t go into the trouble of turning on and off wood several times a day. For the latter, the pellet variant of the classic fireplace may be an effective alternative. Let's take a look together at the positive aspects a pellet fireplace can offer. 1. A pellet fireplace is programmed to turn on by itself. The great advantage of a pellet fireplace is that you can it turn on and off automatically by setting a simple program from the remote control. Thanks to an electronic system, the pressed wood pellets are taken directly from the tank and deposited in the brazier to light up at the set time. But there’s more to it. Pellet fireplaces also adjust themselves to reach a specific temperature, which is impossible with wood-burning fireplaces. 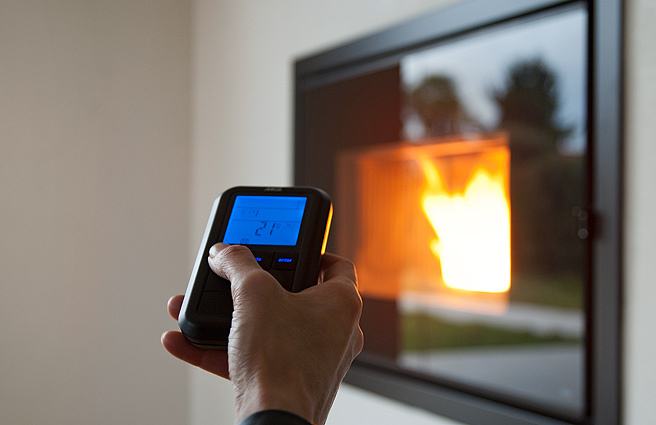 In MCZ Comfort Air® pellet fireplaces, via the remote control you can set different temperatures in the various rooms where warm air is conveyed. 2. The pellet fireplace fits in perfectly with the decor. While on the one hand there’s no question about the convenience of pellets, on the other hand it is true that it is not always easy to find a stove that smoothly blends in with the setting chosen for the decor. Sometimes the best solution is to fit the product directly in the wall, a viable solution only with a fireplace. 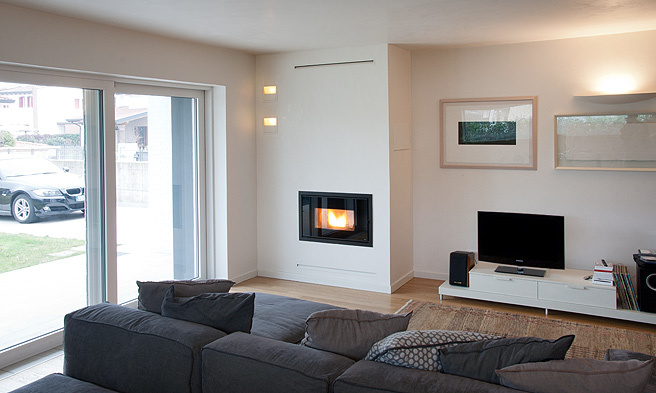 In this project, located in Lyon, in France, the Vivo 80 pellet fireplace by MCZ was installed flush within the wall unit. 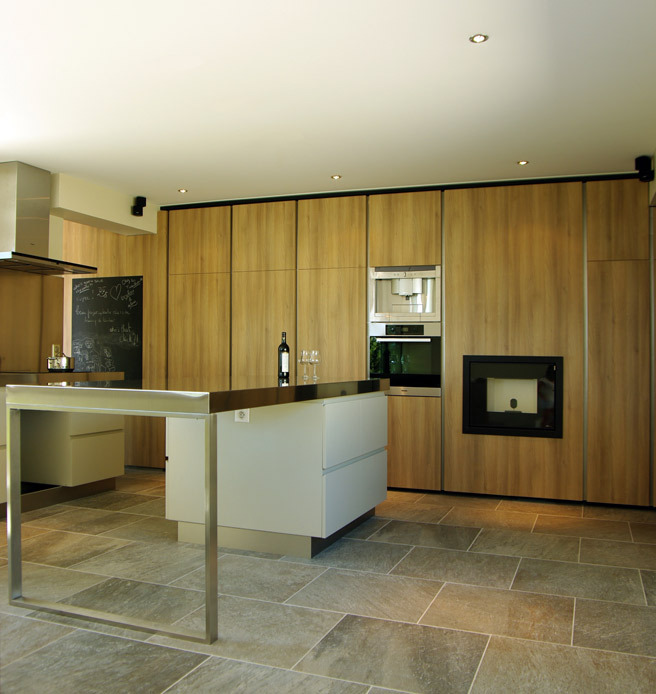 The effect is extremely impressive when the fireplace is on, ultra discreet when switched off and it almost blends in with the other kitchen appliances (click here to read more on this project). 3. The pellet fireplace does not need a woodshed and is more convenient to load and clean. When there is a wood-burning fireplace in the house, you should always allocate a designated dry and covered area to store the logs. Loading and ignition operations can be annoying as well, because the wood is messy and the flame must be constantly attended several times a day to ensure it does not go out. However, pellets can also be stored in the garage in convenient bags containing about 15 kg. To load a pellet fireplace pour the pressed pellets into the tank directly from the bag or use a scoop. This is something you need to do once per day or even less, depending on the hours of operation. 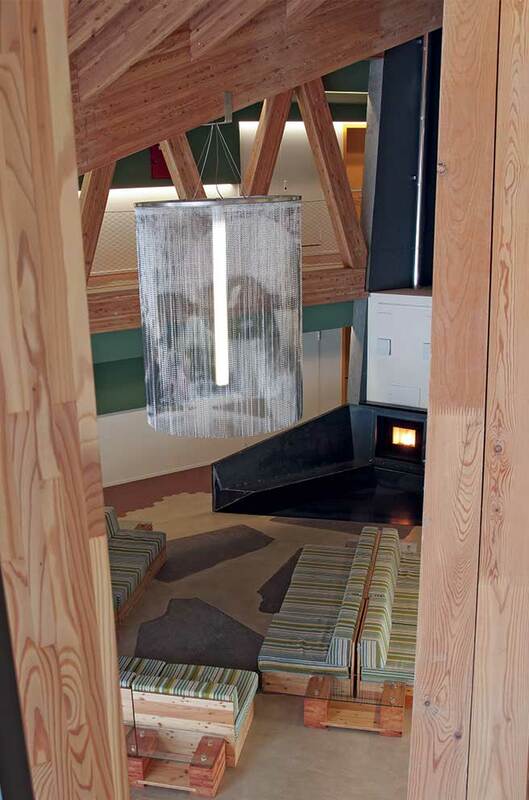 In this project, the Vivo 80 pellet fireplace by MCZ was installed in the foyer of a designer hotel. It was specifically chosen in order not to involve too much staff, as it simply needs to be loaded once a day. The pellets then burn completely, leaving very few residues and cleaning the brazier does not take more than a minute (click here to read more on this article). 4. Pellet fireplaces provide a beautiful flame and quiet operation. In modern pellet fireplaces, the brazier and hot air inlet are specifically designed to ensure both maximum efficiency and an aesthetically pleasing flame. For instance, Vivo 90 pellet product by MCZ has a large-view 16:9 format. Its special feature is an elongated brazier, where the pellets are evenly deposited and create a pleasant and more natural flame compared to traditional pellet products. This ensures both a visual effect and comfort. Vivo 90 can operate even if the fan is off (No-Air function). In the project here below, this fireplace has been chosen in purpose for its format (click here to read more).